Born in Toronto, Joe Phillips has carved out a career as one of Canada’s most versatile double bassists. Currently playing with Art of Time Ensemble, The London Symphonia, Jayme Stone’s Lomax Project and Payadora Tango Ensemble, he has also played and recorded both bass and guitar with Pierre Schryer, Shane Cook, Nuala Kennedy, Sarah Slean, David Braid, Andrew Downing, Miranda Mulholland, Jill Barber, Ruth Moody and the Wailin’ Jennys. 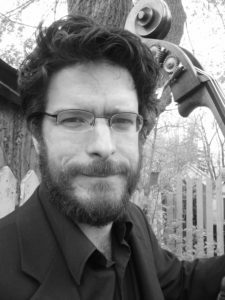 An accomplished classical musician, Joe has been the principal bassist of Orchestra London Canada, Sinfonia Toronto and the Thunder Bay Symphony, and has performed with the Toronto Symphony, the National Arts Centre Orchestra, the Canadian Opera Company and many other ensembles. Joe has had the opportunity to play with some of the best chamber musicians in Canada and the world through his work with the Sweetwater Music Festival, Festival of the Sound, Ottawa Chamber Music Festival and has toured with Canadian chamber music supergroup, Octagon. Joe lives in London Ontario with his partner Sylvie, and their two children.